Ind vs WI 1st test 2018 of West Indies tour of India being played in Saurashtra Cricket Association Rajkot from 04 Oct 2018. For this match, The Indian Cricket Team is a team of youngsters. India has had won several test match series before the lost test series against England by 4-1 in India tour of England series 2018 that was the cause by which India changed the team structure. Prithwi Shah is debuting in this match. Mayank Agrawal and Hanuman Vihari are also in this new Indian team to prove their ability and talent of cricket. This sign is very good for the future of Indian Cricket Team because India will get new talent from this match to create the best Indian Cricket Team full of the talented cricketer for coming World Cup. The Performance of the team of Wes Indies is not looking well after reviewing his previous performances because of West Indies lost the matches against Bangladesh. West Indies is also full of new cricketers for this match so this is the battle between the two teams of youngsters. 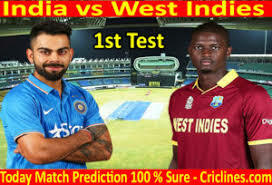 This is the match between the two teams of youngsters so the prediction for this match is too difficult although team India looks stronger in new structure than the team of West Indies. Even India lost the test series against England but this new test has the capacity to defeat the West Indies.